Finding yourself locked out is not only an inconvenience, but it’s also a horrible feeling. When you use Black Hawk and Key, our mobile locksmiths can have you on your way in no time at all. Black Hawk and Key is the name to trust when you need a locksmith in Rochester, NY. In addition to being proud members of 1800unlocks, we also belong to the Fair Trade Locksmith Directory. 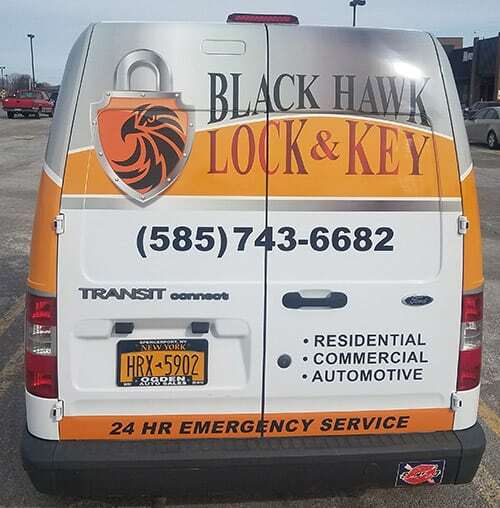 When you need a full-service locksmith in RochesterNY, remember to call Black Hawk Lock and Key. You can count on us for all of your locksmithing needs. Why Black Hawk Lock and Key? Certified – At Black Hawk Lock and Key, our technicians are certified, which means our locksmiths are professionals and have advanced knowledge of locksmithing specializations. Insured – In the course of picking a lock, damage is a possibility regardless of which company you hire. But if you choose Black Hawk Lock and Key, you can feel confident that our locksmiths are insured. You are our priority – We take pride in being the best Rochester locksmith, but our reputation means nothing if our customers aren’t satisfied. Our top priority will always be your satisfaction and security. Choosing to hire an uncertified, uninsured and unregistered locksmith can cost you time and money. Time – When you choose an unprofessional locksmith, they may be late or won’t show up at all. At Black Hawk Lock and Key, you can believe that if we book an appointment, we’ll be there. Money – Unskilled locksmiths do not have the knowledge to deal with the advanced locks and are more likely to cause damage while performing the job. Protect yourself by hiring a licensed, certified locksmith. More Money – If no one has ever heard of the locksmith you chose, it may be a scammer. Reputable locksmiths have been fighting against locksmith scams for years, and we know how much damage they can cause. Keep your security out of the hands of locksmith impersonators by trusting Black Hawk Lock and Key. If you need a professional locksmith in Rochester, NY, choose Black Hawk Lock and Key. Call us today to schedule an appointment.